After you have scrolled through this blog – please look at the site itself..start with the HOME page and then browse through the sections – thanks. Electricity; There is no electricity in our villages or anyw3here near them. 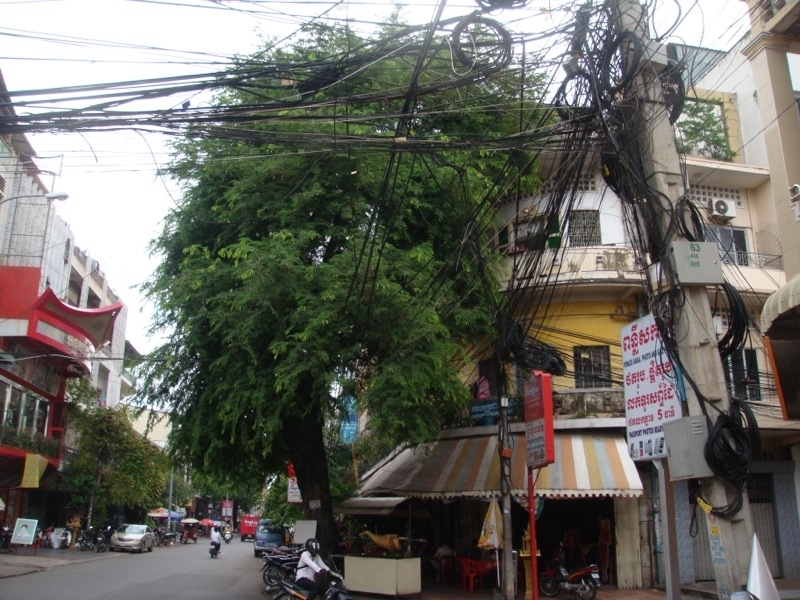 Along some of the major roads of our province electricity is bought from connections across the border with Vietnam. Many homes in our villages own an old car battery which can run small lights and a radio. A man with a diesel generator has a business charging them up every couple of days. Two of our three schools have limited solar power. In this first photo you see solar panels on the teachers’ house. They give light for evening classes and can power a computer for several hours in each room. 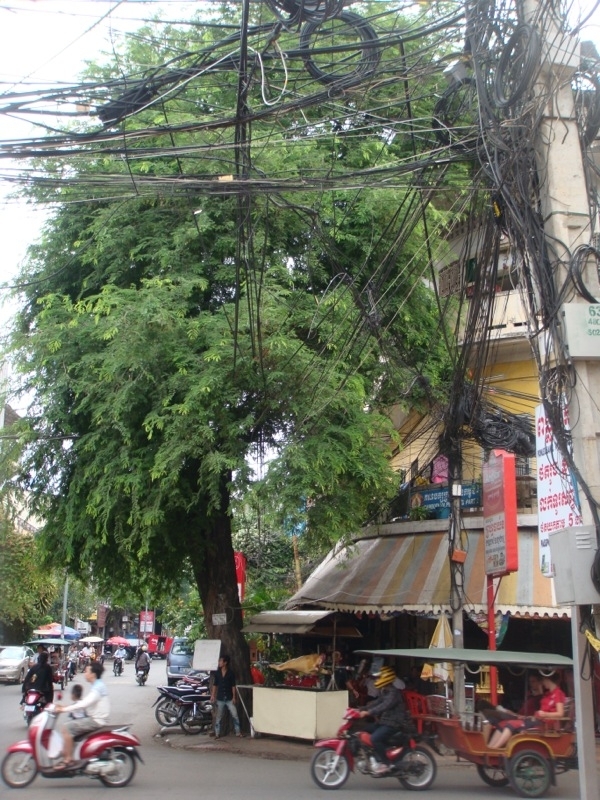 The cities of Cambodia have electricity. 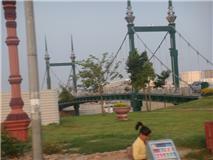 The biggest city is Phnom Penh. There are frequent power cuts and these next three photos show why. 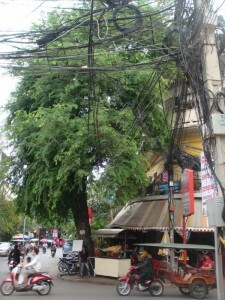 In western countries, residents have reluctantly been persuaded that trees must be well away from power lines and pylons and power poles are expensive. These photos are low resolution but if you would like full resolution photos to study please email John. The trees and foliage have grown around and through the wiring and new wires are simply forced through the branches. We’ve included three photos today taken during Monday’s meeting of The Rotary Club of Phnom Penh Metro, again at Villa Khmer. A week doesn’t go by without several new faces calling in to tell us why they are in Cambodia and what they are doing and usually to ask our advice about the way to go about things here. Its a really good orphanage of 75 severely (more than usual) orphans – many have AIDS, cerebral palsy and other difficult conditions. They have and need a lot of Cambodian staff. No foereigners are paid either here or in the USA. 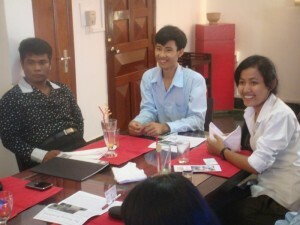 The two happy faces on the right are two of our own Phnom Penh Rotaract members (young Rotary). The Sharing foundation visitors are not members of Rotary – they just came along to tell us what they do. It is a huge advantage to have Rotary support for a project. We encouraged them both to join, particularly the Cambodian manager. 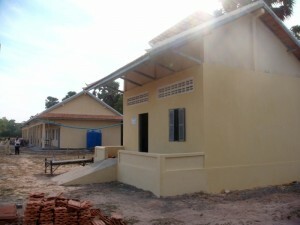 educatingcambodia (this site) is certainly a Rotary project. One of the simple advantages is that people can see that other thoughtful people also support your project. 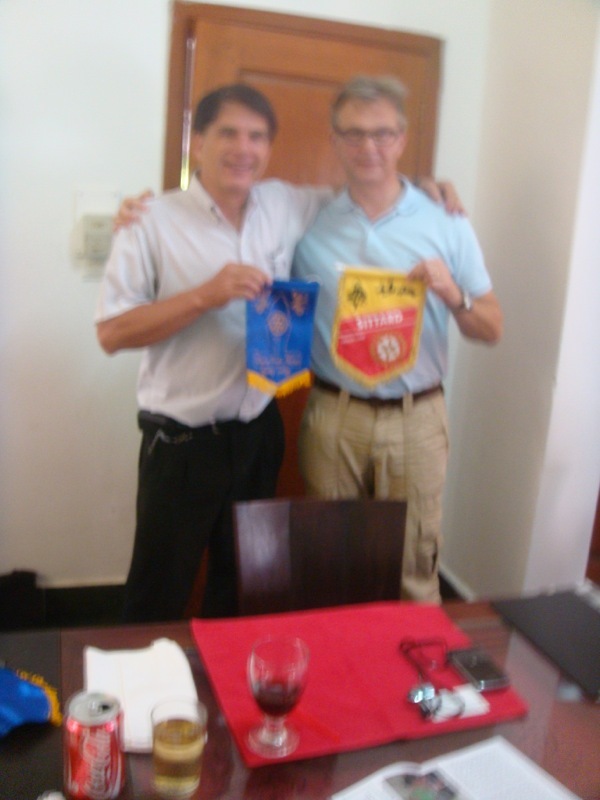 The two men on the left are Chris (immediate past President), holding the Rotary Club of Phnom Penh flag and a Rotary visitor from Holland who gave us an interesting powerpoint presentation. on….Holland! (flags are swapped – Rotary is a worldwide organisation). Next week I should be able to travel to our villages again. I took this photo last week in the ‘re-animation’ ward of Calmette Hospital in Phnom Penh. It was Dr. Suy who finally came up with the Myasthenia Gravis diagnosis. Calmette Hospital has asked me to write 'Nang's Story'. her story through bits and pieces of emails for 5 years. into the possible - a story of determined survival. astonishing and moving and will fit well within educatingcambodia. Please wait, it will take some weeks. 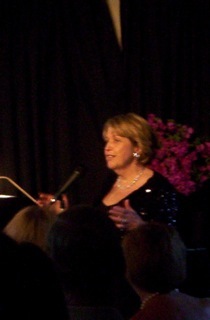 Her story will appear in chapters within the village life section. She's alive; I'm taking her to hospital tomorrow. open the website and join us and please help. 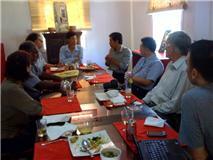 .. there is usually quite a number of guests and visitors at the weekly meetings. At the far end of the table there is one of the 18 new Rotoractors (young Rotary). He is telling us about their ideas, projects and needs. The man in the blue shirt and tie, on the right, is William Wee from Malaysia; his club is 80 years old and he had a lot of good ideas to share with us. I have sent his club the link to this website. Rotary clubs are mutually helpful. His words to me were that it was a real eye opener to see how desperate the rural situation is. If you scroll back to the blog of July 2 you’ll read about a show or cabaret….or indeed a ‘soiree’ presented by friends of mine in Cote d’Azur, France. The performer was a great English actress Annie Reid. 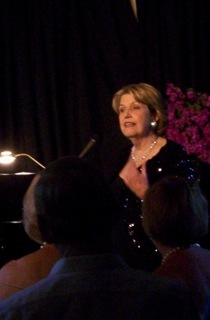 Annie has rarely sung, but for us and her audience in Antibes, she did. The night was a very happy success. Here are two photos of Annie singing and one taking her well deserved rapturous applause. 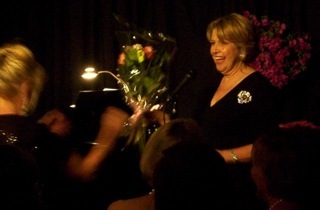 I have spoken with people who were there and it was “fabulous.” Thank you so much Annie and everyone in Antibes. In November 2010, ten members of The Rotary Club of Beaudesert were in Phnom Penh for the Water Festival. The day before we had officially opened our third school in Prey Veng Province. It is estimated that between 3 and 5 million visitors from the Provinces were in Phnom Penh for the boat races and on this the last night there was the biggest and best fireworks display I have ever seen in my life (paid for by the Korean Government). I am writing this after taking the photo today in the hope of clarifying a confusing story badly portrayed overseas. …..and they had to walk across this bridge. Some overseas news reports said there was a bridge COLLAPSE and they were electrocuted or drowned. I’m writing this mostly because every photo of the bridge I have seen is taken ON the bridge showing piles of bodies – and you don’t get a sense of the size of the bridge. BUT this photo shows just how small the bridge was and is. The bridge itself was completely unharmed but swayed a little as many bridges of this design do. So you can see the size of the bridge from a car at this end and half way across. It spans, during the drier months an almost dry creek bed and in November it was deep but obviously just as narrow. That night Calmette Hospital received almost 360 dead bodies and around 800 serious injuries from that bridge. Around 1200 had become jammed and knotted in deep piles of humanity. Police had great difficulty try to pull out the living and many amputations were performed as a result of extreme crush injuries. In our villages we have come to know and love Calmette Hospital.. It’s where we take people in need of hospital…Sadly all the closer ones, in Prey Veng town and even Kompong Cham City are poor hospitals. We have to pay at Calmette and a full day of intensive care costs $40 plus medicine. We have to do the nursing and provide food… BUT Calmette is the best we’ve got… One day I’ll start to tell Nangs story (it’s hinted at within the site) and it is us and Calmette who have kept this particular young mother from our villages alive. So on that terrible night all the dead and injured were brought (mostly) to Calmette Hospital. It’s not a BIG hospital. Next day the hospital announced that almost 600 had died and a day later revised it down to 360……….. in the chaos of the day they had mistakenly added in the USUAL daily death toll at Calmette of 150! Lastly – why did it happen? There wasn’t an enquiry and it was decided that no blame would be apportioned. – Some people were heading to the Island but most were trying to leave. It seems a fight of sorts may have started plus minor panic at the swaying…people continued to press ever forward trying to leave the Island. Maybe guards wouldn’t allow people to move backwards…plus it was the only exit from the island…another bridge was closed to the young people.. This website is called educatingcambodia and there are lessons to be learned OBVIOUSLY…..but I think this tragedy could have happened anywhere. Just finally, look at that bridge again… so very small and for so many to be crushed and die. Cambodia will be shocked by this for a long time. As I said earlier, members of Beaudesert Rotary were close by and safe. The Rotary Club of Phnom Penh Metro met this lunchtime in the Khmer Villa – a Khmer restaurant that serves both Khmer and western food quite cheaply in a good clean atmosphere. If you check through the sections inside this site you’ll find the Rotary section. In this photos you’ll see a lot of western faces; usually its half and half – Khmer people and western. I’ll tell you what the people do. Tom at this end is this years President and Tom runs a Asian Hope – school. 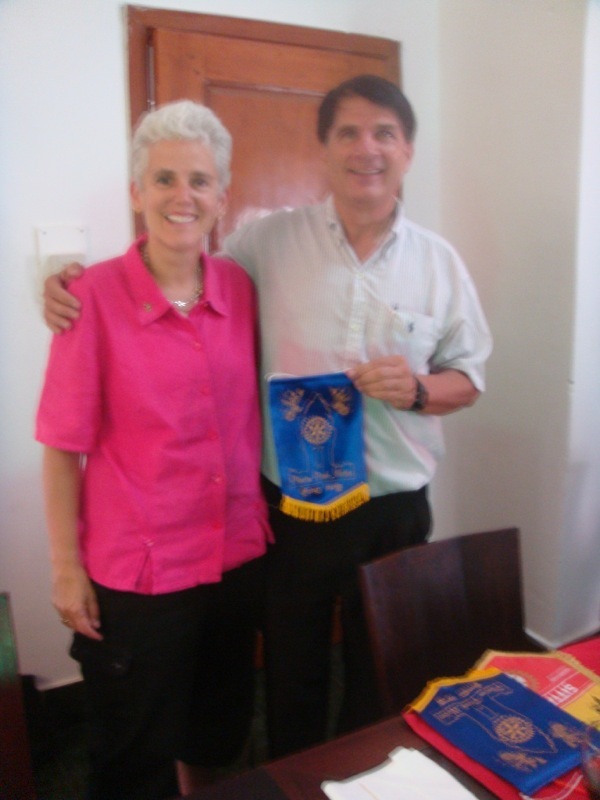 Although I am a member of The Rotary Club Of Beaudesert in Australia, I, like the men and women in these photos attend our sister club RCPPM. At the other endof the table is a poor photo of Sokchea, this years Treasurer and President elect for next year.. I talk about Sokchea within the Rotary section of the site. During the meeting Sokchea told us that ALL his students – thats 18 students are joining Rotaract (Rotary for 18 to 30 year olds). They still need to pay to be chartered and they need to complete at least two projects before they are officially recognised….WELL DONE SOKCHEA!!! Sokcheas fiancee is Sophea sitting this end.. Sophea is a nurse and studied international finance at Deakin University in Australia. Kevin is sitting at Toms left, he is an engineer; here in Cambodia to advice the country nationally on road maintenance. Then there is Bunna, a Yoga teacher. The woman next to Sokchea is Srarot, deeply concerned with health and the welfare of very poor families. There are two men on the right side of the photo, both from Hungary and very experienced Rotarians… great assett to the club. Paula is also on the right. Paula came ten months ago to teach Social Services at university in Phnom Penh and now helps with a project concerned with poverty in Phnom Penh. 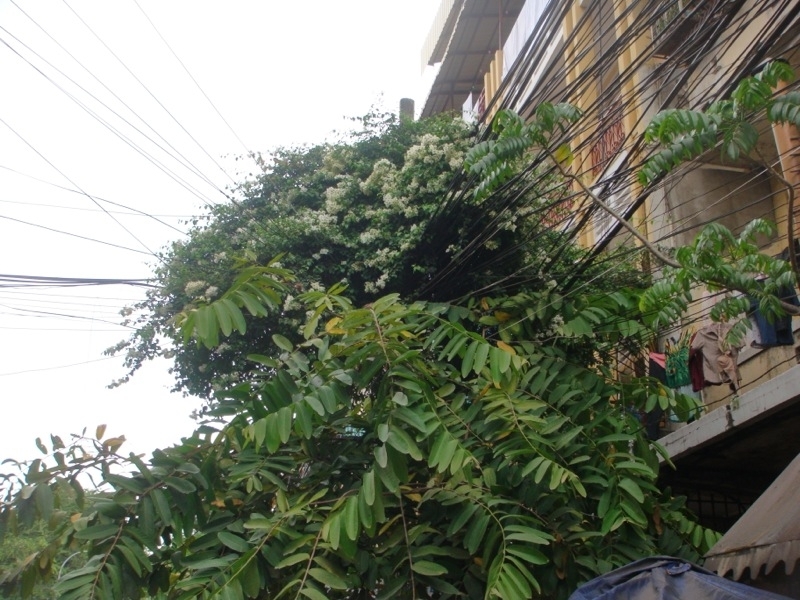 Theres also a man hidden next to Paula from the UK who runs a staff recruitment business in Phnom Penh. He used to be in Rotary and wants to become involved again. 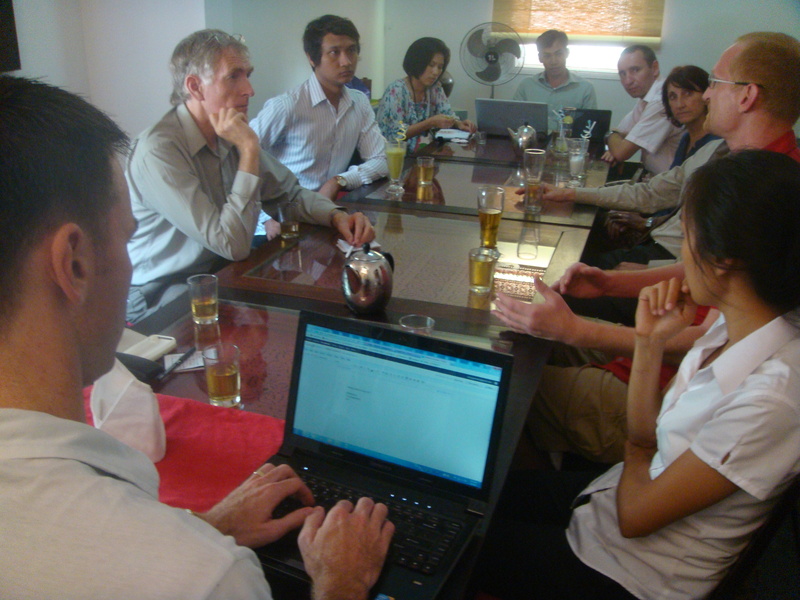 The meetings are weekly and are a great place to share experiences, problems and successes. John. Tonight in Antibes, on the Cote d’azur on the Medterranean coast of France there is a very special show…(a soiree maybe!) to entertain and to support our projects in Prey Veng, Cambodia – for the schools, the children and their villages. This website is just three days old and at 8 in the evening (possibly right now if you are in the audience) it’s ‘Bon Soir’ at Hils’ home on top of Cap dÁntibes. Annie Reid is a wonderful English actress and instantly recognizable.. Annie is performing for her audience and us tonight. To this day and forever I dine out on the fact that I know Annie – a cast member of the cult classic ‘Hot Fuzz.’…. Bon Chance et Good Luck tonight Annie… and 1000 thankyous from the children you help. Antibes (as a region) has been helping us in Cambodia right from the very beginning. The Antibes host is Hils – Hils and I went to Drama School together 44 years ago – Hils and her friend Mags have never once paused in helping as opportunities have arisen.But if you are in tonights audience and have been before, it is to you that most thanks goes; if its your first time, then welcome to the family and thank you. It was no more than a DREAM when Antibes became involved and since then we have made that dream and dreams REAL with three schools and realistic plans for health, nutrition and sanitation.